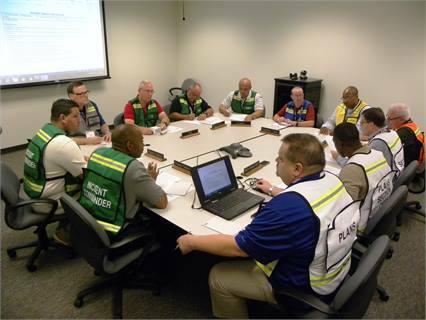 SEPTA staff — and several southern New Jersey area fire/rescue personnel also participating in the crisis training program — worked through every aspect of incident management for disasters occurring in a fictitious town. 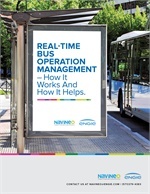 What constitutes a “normal” day in the transit industry? In an instant, regular service can be halted due to an accident, fire or unattended package. In most cases, these incidents are quickly resolved and routine operations are restored after minor disruption, but there is always a chance that a situation can escalate into a large-scale event, requiring the response of a transit agency’s emergency and operations personnel, working alongside a community’s first responder units. While one hopes to never have to answer a call to a catastrophic accident, transit agencies must be ready for the worst, with a plan that can be put into action at a moment’s notice. 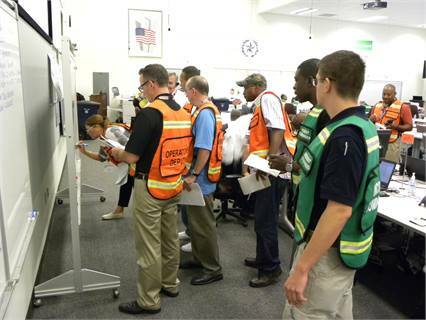 The best way to prepare for an emergency is through regular drills and continual training for a transit organization’s staff — not just operations, safety and police officers, but all employees that might be called into action when an emergency occurs. Recently, more than 30 SEPTA staff members, ranging from operations, police, media relations, IT and System Safety, had the opportunity to attend a week-long jurisdictional crisis training program at the Texas A&M Engineering Extension Service (TEEX) facility in College Station, Texas, as part of a homeland security grant. More than 30 SEPTA staff members had the opportunity to attend a week-long jurisdictional crisis training program at the Texas A&M Engineering Extension Service (TEEX) facility in College Station, Texas, as part of a homeland security grant. Over the course of the program, SEPTA staff — and several southern New Jersey area fire/rescue personnel also participating in the grant program — worked through every aspect of incident management for disasters occurring in a fictitious town. Under the guidance of instructors with incident command and response experience from organizations including the Los Angeles Fire Department; Arlington, Va., Police Department; Massachusetts State Police and NYPD, the training participants role played and set up command posts, dispatched emergency personnel, interacted with joint terrorism task forces, gave press briefings, and managed supply ordering and finances, all in real-time. To help attendees gain a better idea of the jobs of their colleagues, they were often assigned to positions other than their everyday jobs. On the final day of training, the group was assigned roles as close to their usual positions for a SEPTA-related scenario. The TEEX facility setting allowed for program participants to get as close to a “real time and “in the field” experience as possible. Group members collaborated on action plans based on information they gathered in their individual units. Instructors monitoring from above the exercise floor made calls to the units, representing the “mayor” or other key law enforcement personnel. Instructors on the floor monitored participant interaction and offered guidance when needed. All conversations were recorded and played back and analyzed during after action “hot wash” sessions. "Managing a large scale critical incident requires having a familiarity with the various response elements and exposure to the required processes and documentation necessary to facilitate success,” said SEPTA Police Chief Thomas Nestel, who attended the TEEX program. “The training dropped the Transit Police and various other SEPTA employees into several mass casualty scenarios that helped them understand each piece of the emergency response puzzle. The TEEX training facility, simulation technology and staff were phenomenal." SEPTA traveled to New Castle County, Del., for a coordinated response to a train “derailment” on its Wilmington-Newark Regional (commuter) Rail Line. 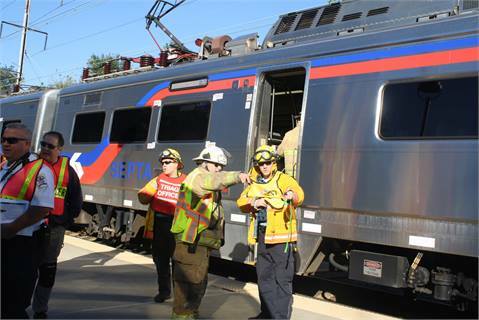 This year, SEPTA traveled to New Castle County, Del., for a coordinated response to a train “derailment” on its Wilmington-Newark Regional (commuter) Rail Line, which operates on Amtrak’s Northeast Corridor. 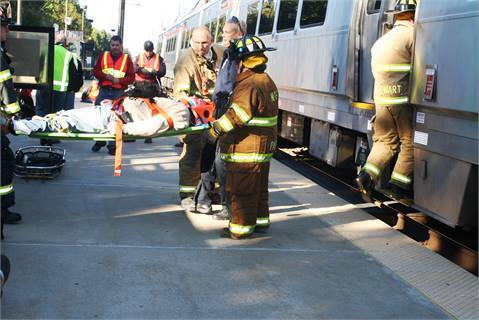 Area firefighters and paramedics joined Amtrak personnel SEPTA System Safety, Police and Railroad Operations staff to respond to a multiple casualty, possible terroristic incident, which was tracked in real-time. A hot wash session followed the drill, allowing all participating units to evaluate their work and provide feedback. “Emergency drills not only help staff practice their skills, the activities also demonstrate to our riders that we are evaluating our safety programs regularly,” said Sauer.